Do you struggle to find an appropriate response to the proponents of evolution? This entertaining and easy-to-understand DVD will equip you to turn the tables by asking your evolutionist friends four simple—yet powerful—questions. Where did the universe’s original matter come from? Where are all the supposed transitional fossils between the Precambrian and Cambrian periods? Where did the dinosaurs come from? 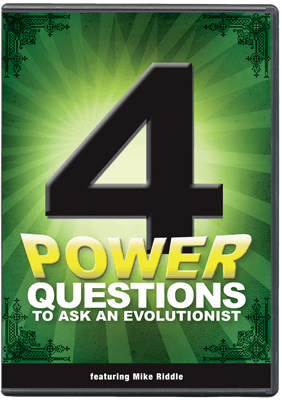 Each “power question” is compelling in itself and leads the evolutionist to understand that he is relying on faith and not empirical science. 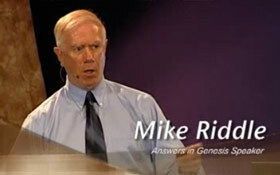 Riddle demonstrates how to use these questions to present the gospel and reveal the truth, that there is a Creator God who made heaven and earth, as recorded in Genesis!